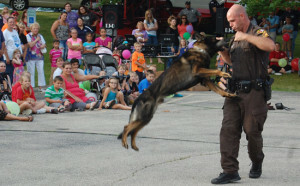 A K9 demo from last summer’s National Night Out in Twin Lakes. The community is invited to join Twin Lakes Police, Fire and Rescue personnel for National Night Out on Tuesday, Aug. 4 at St. John Church on North Lake Avenue, Twin Lakes. Twin Lakes National Night Out festivities include a burn demonstration, jaws of life demonstration, K9 demonstration, free food and music. Posted in: Events, Twin Lakes.